The British Gazette » The Banking crisis: an old insight. 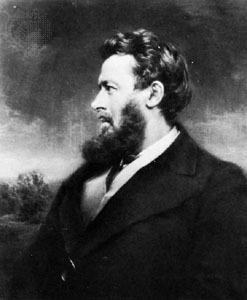 Above, Walter Bagehot, 3rd February 1826 – 24th March 1877. Walter Bagehot’s commentaries on the workings of our constitution and our government are well known. What is less well known is that the great man did not restrict himself to these fields alone. He made an incisive commentary about the banking system. One that is extremely instructive today. It is a well known fact of economic life that the development of the modern banking system was one of the principal pillars on which modern western prosperity was built. The industrial revolution would not have been possible without is for the early joint stock banks enabled the Victorian entrepreneurs to acquire the investment capital for their enterprises. In 1825 and 1826 Parliament approved two banking acts which allowed for the creation of joint stock corporations to be formed for the purposes of operating as banks. Importantly, these banking acts allowed for the creation of corporations with unlimited liability. Those setting up and taking shares in these banks realised that their personal wealth was at stake for in fact their personal assets were effectively at the disposal of the banks creditors. Bagehot warned of the danger that bank shares would ultimately end up being owned by “widows, orphans and the impecunious.” Thus, these banks would become de facto limited, leaving deposits unsecured. Bagehot observed that those with few assets were willing to risk what little they had in order to secure a share in the income the banks were generating. The parliamentarians of 1825 and 1826 understood how banks operated. Unlike the parliamentarians of 2011! They knew that the nature of the banking business is to lend more than one takes in deposits. This is called a liquidity ratio. This was why these wise parliamentarians insisted upon unlimited liability. They foresaw the potential economic catastrophe that would occur were many banks were to go bust that did not have sufficient assets to pay their creditors. The problem Bagehot sought to expose was the practise of persons with little wealth buying banks shares for were the bank to collapse these persons had no assets to pay creditors. The fatal flaw in the operation of these banks – which led to the change in the law to allow limited liability in 1879 – was that control was not exercised by those trading in bank shares over persons becoming shareholders. This in stark contrast to Lloyds of London the insurance providers who did, and still do, impress upon those wealthy persons applying to become “names” that all their wealth is to be placed at the disposal of creditors. Those becoming “names” at Lloyds must have substantial wealth. What we see in the banking crisis today would make Walter Bagehot spin in his grave. Because of their limited liability and the extent to which the banks have lent – way in excess of their assets – the taxpayers have had to bail out the banks. Walter Bagehot’s wisdom expressed in his commentaries should be studied. His commentaries MIGHT point towards a possible solution for the present economic crisis across what is known as “the 1st World” – for do not forget, it is not only British and European banks that are in trouble. This problem extends across “the west.” It is only a matter of time before the governments of the Eurozone are forced to recapitalise their banks in a similar way to the recapitalisation of Britain’s banks. European (mainly German) taxpayers will be required to dig deep – very deep – into their pockets. In this country the government has come up with the idea of “better regulation” to stop another banking crisis. We think that were he alive today, Bagehot would point out that the most effective way – following the necessary taxpayer funded recapitalisation – of preventing a recurrence would be to return to an unlimited corporate structure. That would mean that those private persons and corporations investing in banks were unlimited in their liability. We think that Bagehot would point out that following taxpayer funded recapitalisation would present an opportune time for such a change. He would point to the example of Royal Bank of Scotland 83% of whose shares are now held by the taxpayer. - That the banks are reincorporated as unlimited liability joint stock companies. - That shareholders will only be allowed to hold shares in a proportion to their total net worth (to ensure that they have sufficient assets to pay creditors). - That in return for the unlimited liability undertaken, the shareholders are given some form of recompense by way of tax advantages. Possible “sweeteners” could include making the shares free of income tax. Since the number of such tax exempt shares would be limited by the extent of the personal wealth of the shareholder overall these tax concessions would be spread widely. Such a reform would mean that bank shares could not be freely traded as they are now. It would mean institutional investors such as investment trusts incorporated with limited liability would either have to dispose of their shares or be regulated as to the number of such shares held or even transmit the unlimited liability to the shareholders of the investment trust itself. Bagehot would point out that since most of the shares in Britain’s bailed out banks are owned by the taxpayer – and the taxpayer is wanting to well these, preferably for what they paid for them (expecting a capital gain is naive) – such would be a very good time to start. British Gazette comment: The hypothetical suggestion made by Bagehot’s ghost holds water. Or should that be ectoplasm! We would suggest that the tax system would be an excellent way of supporting and regulating the holding of bank shares. We would suggest that a special section of the tax return be set up where a taxpayer must record the number of such unlimited shares they own and in which banks. The dividend from such would be presumably subject to concessions. The taxpayer would also have to submit in the same section a statement – confirmed by an accountant – as to their total net worth in that fiscal year. Were their total net worth below a certain level – in relation to the number of shares they held – they would be required by law to dispose of sufficient number to restore the ration. Would this mean that banks shares would be the preserve of the rich? No. It would mean that those with modest wealth could only hold a modest number of bank shares. The British Gazette feels that unlimited liability (of the recapitalised banks) could well be the way to prevent future crises as it is the knowledge that Europe’s banks are effectively insolvent which is at the root of the problem.